ST ALBANS SHORT LET is a luxury four bedroom house in the Cathedral Quarter of St Albans close to the Abbey, Verulam Park and the city centre. The house is recently modernised with oak flooring throughout, newly fitted kitchen, bathrooms in fact is totally new inside! It is in a quiet private estate for which we expect guests to respect the quiet location. The house has all the latest mod cons such as Smart TVs, wireless internet and nespresso coffee machine. The fully fitted kitchen includes two ovens, induction hob, fridge freezer, washer/drier, dishwasher etc. The house is ready to move in! 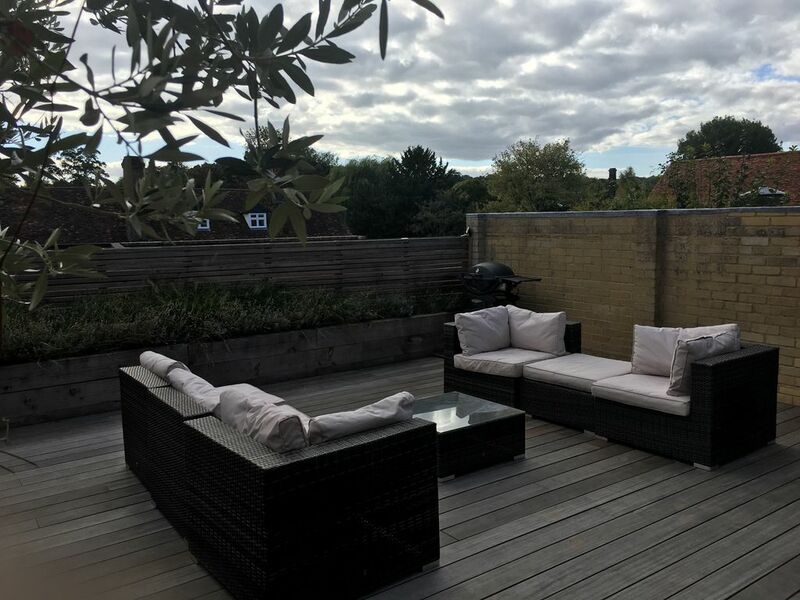 The rear garden has two sets of Bifold’s leading to the hardwood decked patio with outdoor sofas and tables. There are four bedrooms each with double beds, bedside tables and fitted wardrobe. There is a bathroom which includes bath with shower, WC, basin unit and fitted mirror. There is also a separate shower room with continuous hot water and also a separate WC on the ground floor. There is a separate living room with a desk for working and wireless printer as well as a corner sofa bed and smart tv. There is a large cloakroom cupboard for storing outdoor clothing and includes a water softener. The property is ideal for a family or group who are looking for a well fitted house near to the centre but in a quiet residential area who will respect its neighbourly location. Modern, stylish, easy to use, comfortable, great views, sunny, quiet yet convenient to all the amenities of a lovely city.